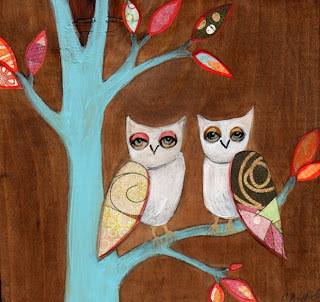 "Better Together" 5.5x5.5 inch painting. Click here to buy original. 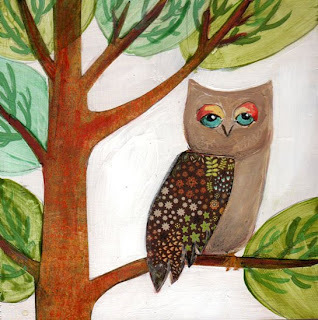 Another owl painting! I think I am in love with these little critters. Did you ever notice that owls look a lot like babies? Okay, maybe I'm just looking at my baby boy for too long, but today I looked at his big big eyes and round face and thought -- ah-ha-- you are a baby OWL. 5.5x5.5 inch original mixed media painting on wood. Click here to buy print (original sold). Continuing along with my owl theme, I finished this new little one yesterday. I must say that she is one of my favorites in the collection. I like her flowery, starry wing. 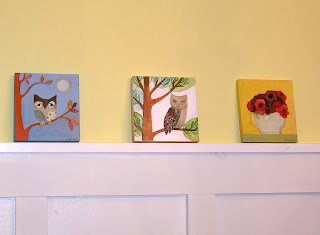 Here are two of my owls on their perch in my dining room before being shipped off to their new homes. 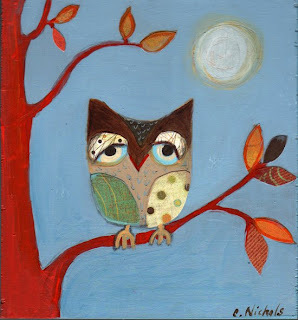 I wish I had been fast enough to photograph "Night Owl, " too, but he is already with his new owner. "Little Dreamer" is being shipped to Dawn in Missouri today. "Little Dreamer" 5.5x5.5 inches -- mixed media on wood. Click here to buy print (original sold). I finished this little guy today while the moon was rising outside my window. The night sky was such a beautiful blue-gray color against the sillouette of trees and bright white moon...I just couldn't help buy be inspired. The November issue of Canvas Magazine is out, and I'm happy to see that my painting, "Poem," is the background for issues on recycling and saving the planet. This is the good news. The bad news is that we start daylight saving time today, and little Nicolas decided to awaken at 5 a.m. -- whoever invented this idea does not have kids. But the person that invented coffee certainly did. I'm hoping to fit in some creative time as soon as my babysitter comes back from a little vacation.